There’s a number of ways we could implement platform specific code in Windows Universal Apps which I’ll cover in future articles. In this article we’ll look at an often underused feature of C#: partial classes and methods. Partial classes allow us to split the definition of a class over multiple .cs files. The files all contain the same namespace and class names, but the class name is preceded by the partial keyword modifier. Partial methods allow a method to be defined but that doesn’t contain an implementation, the implementation can then be provided in another partial class file. If you want to get an overview of Universal Apps, check out this previous article. For the sake of this demo, say we have a class “Identity” that displays a message box stating whether we’re in a Windows Store or Phone app. So this is a simple example, but if there were lots of these conditional directives, we can tidy things up a little. This class still contains the method that’s called from each of the apps, but this time the creation of the content of the message is delegated to a method called “CalcMessage”. 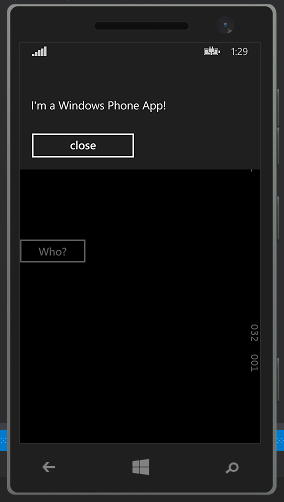 This method sets the private field to be used in the dialog. In the “Identity” class, the “CalcMessage” is declared as a partial method. This means that it doesn’t contain an implementation, but the “WhoAmI” method can still call it. The actual implementation of the code that decides on the message is unique to the two apps. Now the implementation of CalcMessage can be different for both platforms, but other code can still be shared in the shared project version of Identity.cs. We also now don’t have any conditional directives in use. If we only have one or two of these conditional directives, then it’s probably easier to just keep them as is, but if there are lots of them and it’s making readability harder then partials may be a useful alternative.